At a crowded Starbucks, a man in his fifties bumps into me, spilling his iced coffee on my white blouse and causing brown caffeine tears to roll down to my True Religion designer jeans. But while my mind angrily curses in Russian, my right shoulder begins to twitch, and as soon as I let go of my knee-jerk ‘I hate people’ response, suddenly my eyes are penetrating through this man’s abdomen like an X-ray machine. Through his Hawaiian shirt, layers of fat and flabby muscle, I am seeing a bleeding lesion in his stomach. He’s apologizing now, but I cut him short: “You shouldn’t be drinking that much coffee. You have an ulcer.” He stops cold and stares at me, as I continue to stare though his stomach, trying to soften the message with “Never mind, I drink too much myself sometimes.” But as I mumble these words, my shoulder continues to twitch, pumping liquid gold light into his belly as I watch his ulcer completely dissolve and know that he’s healed. “Venti nonfat cappuccino for Katherine,” I hear the voice calling me to get my drink. “Have a nice day,” I say to this stranger as I head toward the counter. “You’re fine now, but please take care of yourself. ” I leave the shop thinking, I’d better develop some socially suitable skills that won’t freak people out while I’m healing them, if that’s something I’m going to continue to do. This book takes readers inside the large, loud Agranovich household, where otherworldly encounters are accepted like grades and shoe sizes, and homework is often a cosmic lesson. 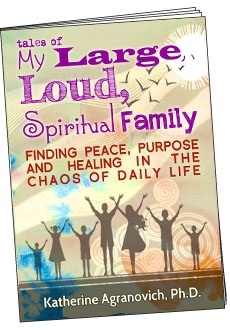 Each day takes the family on a quirky spiritual adventure where “weird, crazy and abnormal” become the norm. © 2019 Katherine Agranovich. All Rights Reserved.